I have found this amazing organism in one of my books. When I read the whole thing and read that sentence, I knew this would be great for my blog. This organism is half animal half plant. So if you’re interested please continue reading. Euglena is a genus of single-celled flagellate Eukaryotes. It is the best known and most widely studied member of the class Euglenoidea, a diverse group containing some 54 genera and at least 800 species. Species of Euglena are found in fresh and salt waters. They are often abundant in quiet inland waters where they may bloom in numbers sufficient to color the surface of ponds and ditches green (E. viridis) or red (E. sanguinea). The species Euglena gracilis has been used extensively in the laboratory as a model organism. Most species of Euglena have photosynthesizing chloroplasts within the body of the cell, which enable them to feed by autotrophy, like plants. However, they can also take nourishment heterotrophically, like animals. Since Euglena have features of both animals and plants, early taxonomists, working within the Linnaean three-kingdom system of biological classification, found them difficult to classify. It was the question of where to put such “unclassifiable” creatures that prompted Ernst Haeckel to add a third living kingdom (a fourth kingdom in toto) to the Animale, Vegetabile (and Lapideum meaning Mineral) of Linnaeus: the Kingdom Protista. When feeding as a heterotroph, Euglena takes in nutrients by osmotrophy, and can survive without light on a diet of organic matter, such as beef extract, peptone, acetate, ethanol or carbohydrates. When there is sufficient sunlight for it to feed by phototrophy, it uses chloroplasts containing the pigments chlorophyll a and chlorophyll b to produce sugars by photosynthesis. 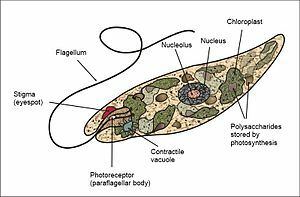 Euglena’s chloroplasts are surrounded by three membranes, while those of plants and the green algae (among which earlier taxonomists often placed Euglena) have only two membranes. This fact has been taken as morphological evidence that Euglena’s chloroplasts evolved from a eukaryotic green alga. Thus, the intriguing similarities between Euglena and the plants would have arisen not because of kinship but because of a secondary endosymbiosis. Molecular phylogenetic analysis has lent support to this hypothesis, and it is now generally accepted. Euglena chloroplasts contain pyrenoids, used in the synthesis of paramylon, a form of starch energy storage enabling Euglena to survive periods of light deprivation. The presence of pyrenoids is used as an identifying feature of the genus, separating it from other euglenoids, such as Lepocinclis and Phacus. All euglenoids have two flagella rooted in basal bodies located in a small reservoir at the front of the cell. In Euglena, one flagellum is very short, and does not protrude from the cell, while the other is relatively long, and often easily visible with light microscopy. In some species, the longer, emergent flagellum is used to help the organism swim. Like other euglenoids, Euglena possess a red eyespot, an organelle composed of carotenoid pigment granules. The red spot itself is not thought to be photosensitive. Rather, it filters the sunlight that falls on a light-detecting structure at the base of the flagellum (a swelling, known as the paraflagellar body), allowing only certain wavelengths of light to reach it. As the cell rotates with respect to the light source, the eyespot partially blocks the source, permitting the Euglena to find the light and move toward it (a process known as phototaxis). Euglena lacks a cell wall. Instead, it has a pellicle made up of a protein layer supported by a substructure of microtubules, arranged in strips spiraling around the cell. The action of these pellicle strips sliding over one another gives Euglena its exceptional flexibility and contractility. In low moisture conditions, or when food is scarce, Euglena forms a protective wall around itself and lies dormant as a resting cyst until environmental conditions improve. Euglena reproduce asexually through binary fission, a form of cell division. Reproduction begins with the mitosis of the cell nucleus, followed by the division of the cell itself. Euglena divide longitudinally, beginning at the front end of the cell, with the duplication of flagellar processes, gullet and stigma. Presently, a cleavage forms in the anterior, and a V-shaped bifurcation gradually moves toward the posterior, until the two halves are entirely separated. For more of these amazing animals and plants please hit that like button on the top. The sleeping grass is one of my best plants and animal post. Go to the search box and find it. I really enjoyed that…very fascinating!